Did everyone enjoy the holiday weekend? We sure did. We went hiking, relaxed at our friend’s pool, enjoyed dinner with friends, watched fireworks with the neighborhood, and got some things done around the house. We were busy the entire weekend. I need a day of rest now:) I was pretty tired last night, so I made an easy sweet corn salad for dinner. During the summer, I could eat sweet corn for dinner every night. I just love it. I grew up in Illinois, where corn is plentiful and so good. I miss Illinois’s corn, but luckily, Utah’s sweet corn is tasty too. It is a little early for corn, but I found some at a local stand and gave it a try. I was pleasantly surprised. The corn was sweet, juicy, and so delicious in this salad. I added all of my favorite flavors-cilantro, lime, red pepper, tomatoes, and red onion. I sprinkled feta cheese on the top and we dug in. 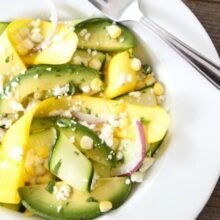 If you are a sweet corn lover, like me, make this salad. It is a great way to enjoy summer’s fresh produce. 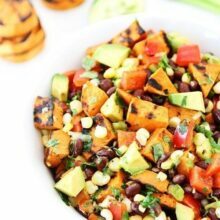 You can serve it as a side dish to chicken, fish, or you can stir in black beans for added protein. It is also good with tortilla chips. Enjoy this recipe all summer long! 1. In a large pot, bring water to a boil. Gently add the sweet corn to the boiling water. Cook 2-3 minutes. Remove from water and let cool. Once cool, remove the corn kernels with a knife. Discard the ears. 2. 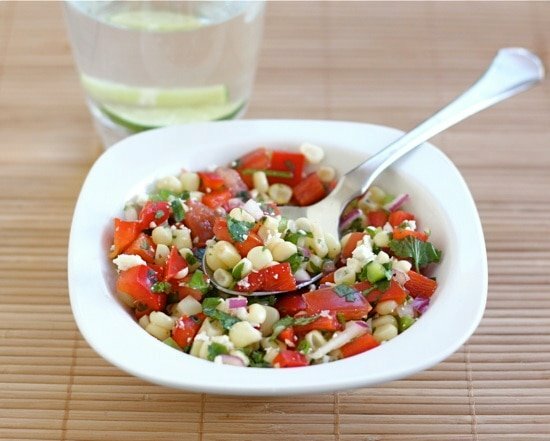 In a large bowl, add the tomatoes, red pepper, red onion, cilantro, and jalapeno. Stir in the sweet corn. Add the lime juice and stir again. Sprinkle salad with feta cheese, salt, and pepper. Gently stir. 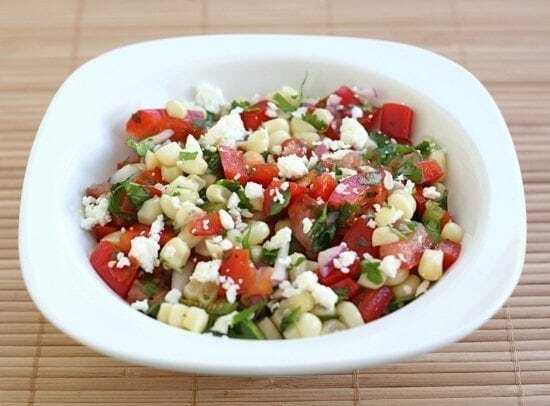 *Note-you can add black beans or serve this as a side salad to fish, chicken, or any meat. It is also good with tortilla chips. ooh, perfect summer salad 🙂 glad you had a great weekend! I’ve been loving sweet corn lately also. You know it’s good when you could eat it raw and it would still be tasty! This looks like a great combination of flavors! This looks wonderful. Light, refreshing…perfect for summer! The feta looks fabulous in there! I am so going to make this! Beautiful photos, too! I need a break after this holiday weekend too! Why don’t we relax on vacation, instead of tackling everything on our to-do list? That looks absolutely delicious! I love sweet corn, too. Lovely, I made a similar salad to go with steak, it’s very versatile! The feta cheese is a great addition! I’m loving this. Light and healthy-it’s a great summer salad. your gorgeous dish is so bright and singing of Summer! Loving the feta cheese too ! I’m with you, I could eat fresh corn every night. My entire family loves it actually. I’ll have to give this one a try. It looks so delicious! I love how light and fresh this salad is! Can’t wait for sweet corn to appear here! Oh, I love the feta chesse in this salad! Beautiful and just a bit different from what I usually make. I agree with you about being tired from the three day weekend . . . we all need a day off now! Lovely! Too bad my hubs is not a huge fan of corn. mmm…good ol’ sweet corn. the salty feta on top is a great touch! This looks so fresh and summery and delicious. It’s soooo hot here! Looks like a lovely salad… I love sweet corn! I had a busy weekend too, but some of it started and ended with long times at the pool. 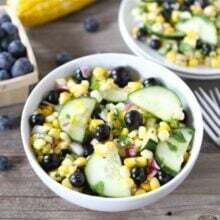 The sweet corn salad is a perfect dinner (I love summer when cooking dinner means a salad). It’s pretty too. We do a lot of corn things here in Nashville. We just tried a sweet corn stir fry with shrimp and sweet onions. This looks great. Love that it’s nice and simple with only lime juice and salt and pepper to season. I think I’ll have to try it soon! I have all these ingredients right now! Including a huge bucket of feta. So I think this will be lunch! This is great! I’ve been looking for a salad just like it. We ended up with more corn than I expected this year which isn’t a bad problem to have, but I’m on the lookout for ways to use it. Awesome summer salad! I love simple meals like this in the summer. Really nice combination of flavors in this salad! Great way to highlight sweet corn. First of all – gorgeous photo! Love this salad, I would eat this every day. YUM! looks delicious! I love corn in the summer!! STRAWBERRIES WITH FETA??? HMMMM. I MAY HAVE TO TRY THAT. 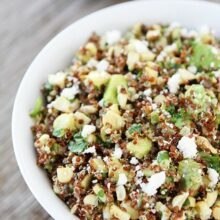 This is one of our favorite summer salads! 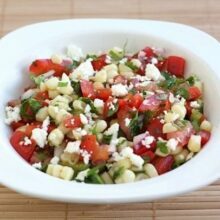 I have been tossing the corn on the grill and then mix everything together for a wonderful side dish. Farmer’s Market tomorrow… will have to pick up corn! This is a perfect summer salad! Do you think I could sub mozzarella, or another cheese cut into small cubes in this salad? husband won’t eat feta unfortunately, but I really want to make this. what kind of cheese would you recommend? I have some fresh mozzarella at home that’s waiting to be used…would that work? Yes, sub whatever cheese you like. Mozzarella would be great! Let me know if you try it! This sounds really yummy. I have some people coming over for Labor Day, maybe I’ll make this as a nice side and if not, I’ll make it for myself. I just love sweet white corn. Had a pregnancy craving for sweetcorn…these were just what I needed to satisfy my need!!! !